A few weeks ago, John and I went to Las Vegas for my cousin’s wedding. Neither of us had ever been there before. We had so much fun! We gambled a little, went to a couple shows and had a great time at the wedding. We stayed at Caesar’s Palace. Here’s some pictures from our trip. Thanks my dream vacation! I think it would be a neat to visit there. If you find unfinished contest by me. I loose my page everytime I have to go to another page . I know I NEED simple! Sounds like fun! I’ve never been to Las Vegas, but hope to some day! It sounds like fun. If you’re going to a wedding-why not. My son went not too long ago for work. He enjoyed it,. I totally want to go to Vegas! first time?! Looks like you had fun! The strip looks cleaner during the day and from up high!!! I was there in 2008 but by myself on a layover from a fire detail I was on, so I pretty much lost $20 in a slot machine, saw the aquarium @ Mandalay Bay, saw the pirate show, the fountain thing, and had a SUPER expensive twisted lemonade. Woohoo! Great photos! How fun! I’ve never been to Vegas before but everyone that has been there always says that it is a lot of fun! I went to Vegas for the first time when my youngest was 5 months old… we didn’t want to leave her behind so we took her with us..and even though you can’t gamble while holding an infant….lol..it was a great time! Neither of us is a big gambler anyway, so it was more of a business trip combined with shows, dinners out…and sightseeing… it was wonderful 🙂 The Venitian blew my mind! Would love to go to Las Vegas! I have always wanted to go to vegas! looks like a blast! I’ve been to vegas twice (this year and in 2002) and I enjoyed myself. We stay at mandalay bay tho… Cesar’s palace looks lovely! O my I want to take a trip with my husband here so bad! It is a vaca that I will take one day in the next 5 years I hope!!! I went to Vegas in 2000. It was great, even if you’re not a gambler. I regret not seeing the Sigfried & Roy show, particularly since it is no longer around. I’ve always been more of a Steve Irwin & Jeff Corwin type of animal person than glitzy show type. Ha Ha. I love that you posted a photo of the snack prices. Can you believe the prices of even a bottle of water? Crazy, but sometimes you’re just THAT thirsty! I’ve always wanted to go to vegas! I would love to go to Las Vegas. Sounds like you had a great time. I have not been to Vegas yet but hopefully one of these years I will be able to afford to go. You HAVE to try the buffet at the Bellagio. One of the best! Come hungry!! Vegas is a must travel for me! I would love to go to Las Vegas, one of these days my staci will take me. Wow! You guys stayed on the 40th floor? I always like ground level! Did you see the movie Towering Infurno! I know it’s an old one , it has stayed with me all od these years! $40.00 for peanuts id a bit much! I don’t think I would let my family have them either! 🙂 I Love your picyures. Vegas is a great place! I took my husband there a few months ago for his first visit. We went to the M&M store which my daughter LOVED and my husband fell in love with the Coca Cola store next store lol. Isn’t Vegas so much fun? And I barely even gamble. I haven’t been for years though and looks like I’ll be pleased with some new stuff to see and do when I do go back. Myself and 3 of my 4 sisters went to Vegas a couple of years ago. We had the best time, laughing, sharing and getting to know each other again. It was like we were teenagers again, without all the angst. Best time ever! I can’t decide if I want a rebel Vegas wedding or a hippie barn wedding. I’m going to Vegas b/f I die I hope 🙂 I have always thought it was a amazing place to visit! I have never been to Vegas, hopefully one day! I love Vegas. Ceasars Palace is awesome! We luck out cuz we have family that lives there. I would love to go there! Caesars would be a dream! Okay – sounds like you and John did everything right in Vegas for first timers: attended wedding – check. 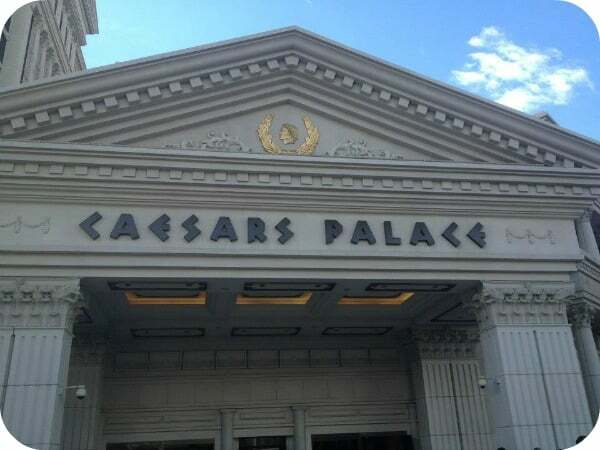 Caesar’s Place – check. Nutty limo – check, etc. Good work. (I got married in Vegas when I was young and crazy – we had our wedding at Treasure Island and reception at Emeril’s Steakhouse in the MGM Grand).